Food choice is good, pre-ordered selections come with included water and a wider choice. Paired seats at rear of aircraft are good for couples travelling together. 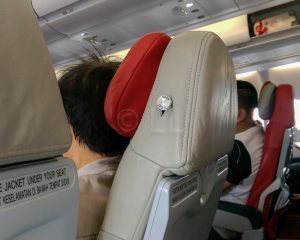 Seats at the back are affected by engine noise, can be an issue if you want to sleep. You get what you pay for, so it's a good idea to select your seat. 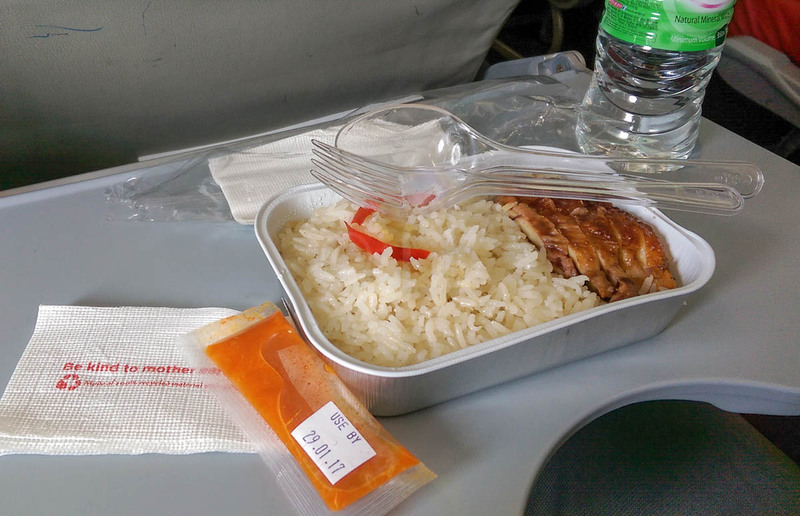 The food choice is quite good, especially if you pre-book. Ensure you pre-book enough baggage. Excess baggage is expensive! 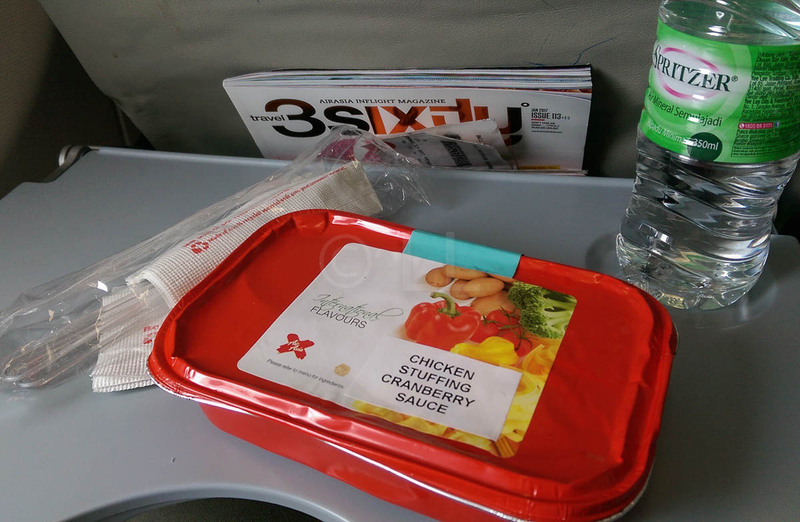 We flew AirAsia X Gold Coast to Kuala Lumpur recently on AirAsia X’s A300 – 343 Registration no 9M-XBA, one of the newest planes in the fleet, having been delivered on 13th May 2016. After taking off to the south nearly an hour late into clear blue skies, we flew into cloud before we passed directly over Brisbane, the state capital. The pilot apologised for the delay, which he attributed to late arrival of the aircraft on the previous sector, as he gave us some technical information about our flight. Despite a few slightly bumpy periods on the way, mostly through cloudy skies, we were able to make up time to land in Kuala Lumpur’s KLIA2 terminal only 8 minutes behind schedule at 5.28pm local time. This was the return leg of a flight already taken from Kuala Lumpur to Gold Coast. 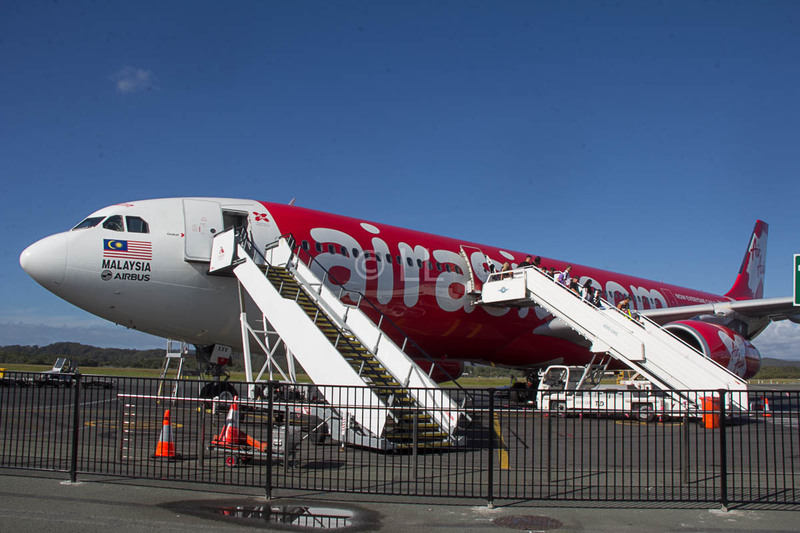 As described in that piece, we booked the tickets directly through the AirAsia website, as we discovered that Expedia would not allow differences in baggage selection for each passenger. **Remember – with a common booking, you can combine your baggage allowance on AirAsia flights. It’s also easier to book seats together in a combined booking. Do make sure you read carefully and check only the boxes you require, some boxes are pre-checked and you may find you have baggage, insurance or a hire car you don’t want. Be aware too, that there is a ‘convenience fee’ for booking with your credit card. 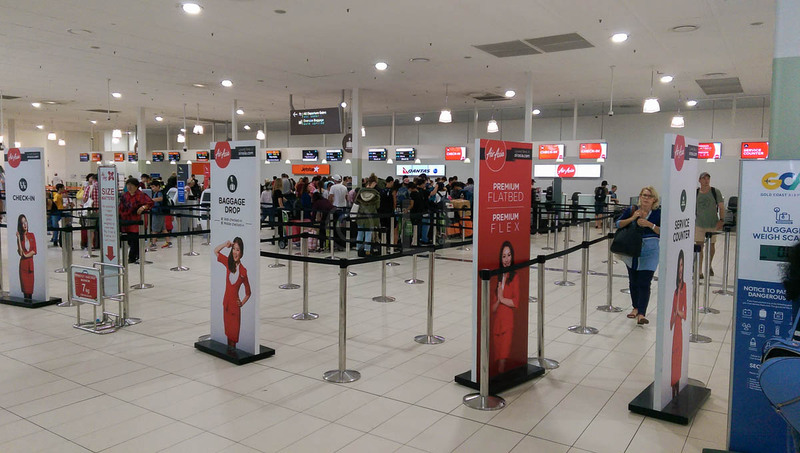 Getting through the airport: AirAsiaX encourages web check-in and it is a good idea to use this. If your journey is less than 2 weeks, you can check-in for both legs and print your boarding pass before you go. If you have your check-in done, they’ll just take your luggage at the designated bag drop counter and print your actual boarding pass. We were through that in less than ten minutes and were able to go into the common domestic/international departure lounge and enjoy a relaxed cup of coffee before going through the International security checks and immigration. 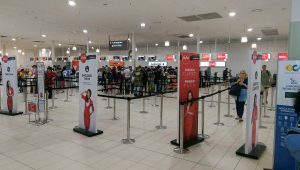 UPDATE: As at 20th March 2017, AirAsia passengers can use the AirAsia self check-in kiosks which will be operational at the Gold Coast Airport. 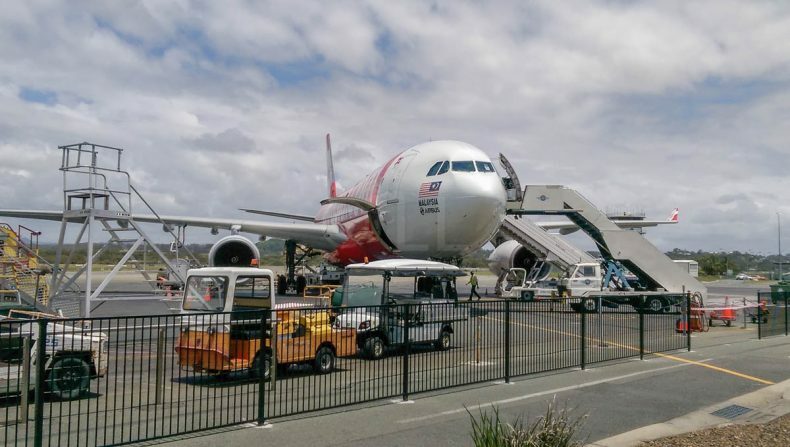 Gold Coast Airport (Coolangatta) have, since our last visit, implemented the long awaited Smart Gate passport controls for departing passengers. There was no long queue and as the process is quick and easy (place your passport information page on the reader and look at the camera) we were through very quickly. 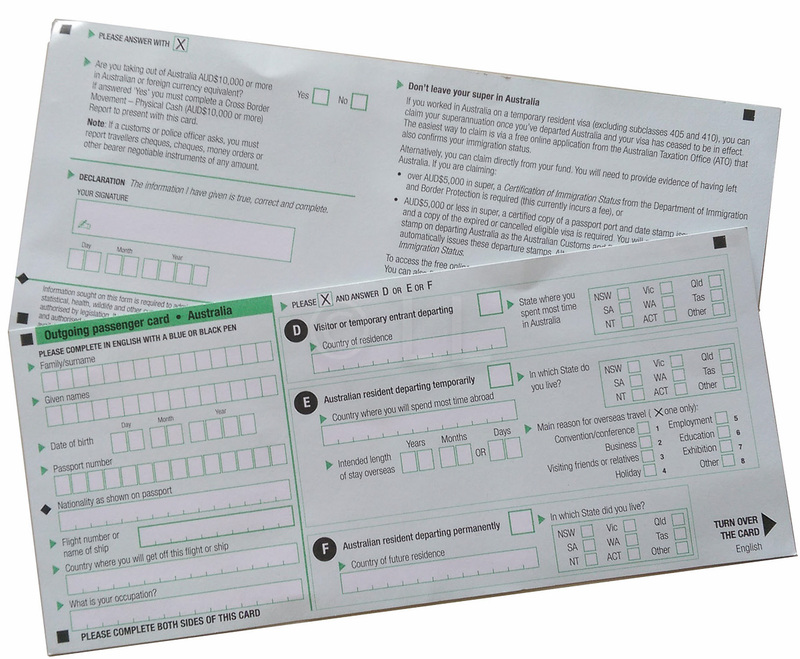 This system is available for all passports, not just Australian, but you still have to complete the green immigration forms, which you drop into the box as you exit to the Departure lounge. On board, we were greeted by friendly staff, we found our seats and settled in. This aircraft is configured with 12 Premium seats in the front cabin, and 365 standard seats spread nine across two aisles in a 3/3/3 arrangement, except for the last eight rows (Rows 44-51) where the seats are arranged 2/3/2. 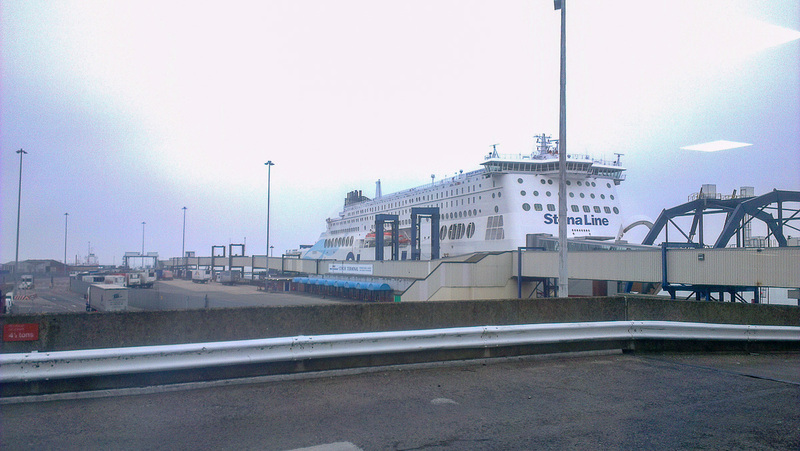 The cabins are arranged into a quiet cabin (Rows 7-14, only available for passengers aged 12 and above, at an extra charge) and two larger cabins, all demarcated by toilets. The toilets are positioned as one near Row 15, four after Row 33 and two at the rear of the aircraft. There is an exit row just before the start and another at the back of the wing separating the balance of the Economy seats into two cabins. These exit row seats (Row 15/16/17 and Rows 34/35 ) are designated ‘hot seats’ and are also available for a higher charge than a standard seat. All standard seats are arranged three either side of a single aisle until Row 43, with those in arranged in a 2-3-2 layout. My companion and I were seated in 47A and C, in the rear section. The window seats in this row have two windows, with a wall space between. The width of the seat is a standard 18″ (though it is a bit tighter between the armrests) as is the pitch at 32″. The headrest can be raised and lowered and has turn on wings as well, although they are quite small. There is a coat hook on the side of the headrest in front and the recline is standard and adequate. From prior experience, we know that this flight usually tracks a route north towards Brisbane, before turning northwest across Queensland to the Gulf of Carpentaria and on over Darwin and Timor. Normally a clear day will give passengers in the ‘A’ seats an impressive view of Brisbane and later the Gulf and usually Darwin (capital of the Northern Territory) as well. Unfortunately, the heavy cloud meant none of this was visible on this occasion. Legroom in this particular aircraft was a more generous 11″ which, combined with the fact that it was necessary only to climb over one person to reach the aisle from the paired seats at the back, was more than adequate. 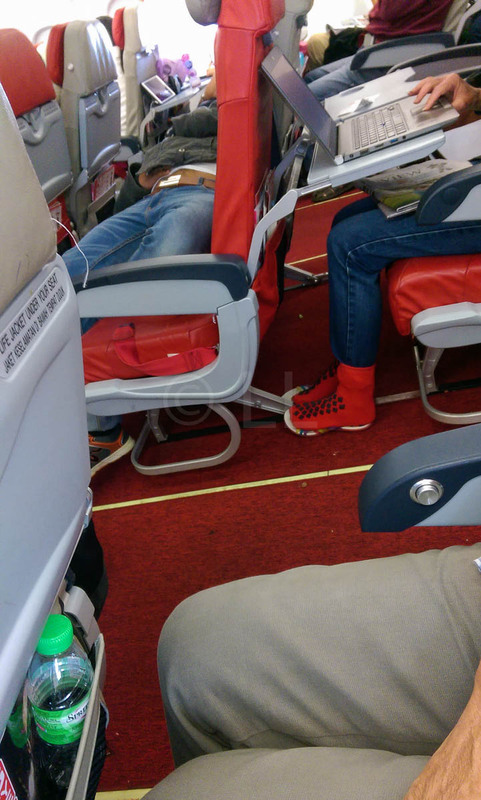 There is no footrest, but the space beneath the seat in front is clear for all seats and in this aircraft, there was a generous gap of around 4-5″ between the window seat and the cabin wall, which also gave more room at foot level to stretch out. The tray table is a non-fold table which can be pulled closer to the user during meals, or to use as a work space. There is a slight ridge at the edge, as well as a cut out in the centre. Although there is no power supply available in the economy seating, it was a day flight and a number of people were using laptops and other devices. There is no in-seat entertainment available on board this aircraft. However, entertainment devices pre-loaded with entertainment options are available and may be pre-booked. This product has recently been upgraded to Xcite Inflight Entertainment, offering a wider choice of entertainment and language options. 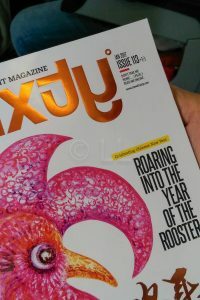 The in-flight magazine provided some good reading and you will also have an in-flight menu and duty-free booklet to browse if you run out of reading material. We pre-booked our meals for this flight. This is the best way to ensure that you receive your choice and you will be served before those who purchase on board. 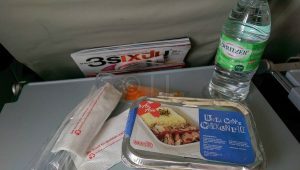 In addition, pre-booked meals come with a bottle of water and the choice is wider with some meals only available online. The meal service is usually fairly fast for pre-booked meals, but as the meal trolley seemed to stop at all seats, working from the front, our meals took over an hour from the time the trolley left the galley just behind us. There are two meal services on this route and meals can be pre-booked for either one or both services. Both our meals were adequate in quantity, although the chicken in the chicken rice appeared smaller than in the booking photo. The rice was tasty and came with authentic chilli sauce. The chicken and cranberry sauce was boneless and reasonably tender. Unfortunately, the vegetables were overcooked and both meals were no longer hot when served. 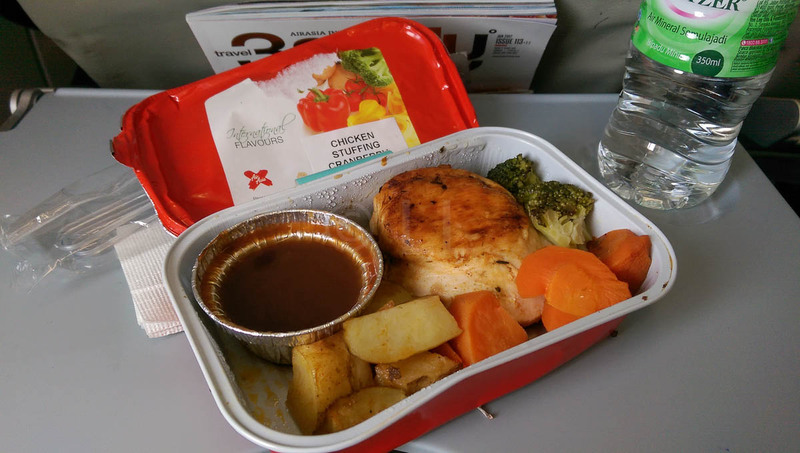 It is most likely that the pre-packed meals were carried on the earlier flight in to Gold Coast and although they did not taste bad, they tasted slightly less than fresh. 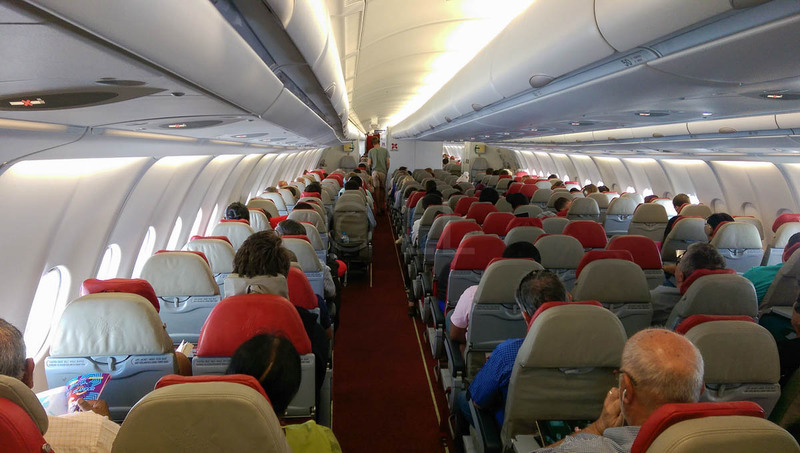 Selecting your seat is really a matter of personal preference, depending on such diverse considerations such as whether you want to be in a quiet area, have more leg room, be first to see the food trolley or even be able to reach the toilet easily. However, it’s useful to know things like whether you’ll have a window, or even part of one, if you want to rest your head or see where you’re going. As you pay differing amounts to choose your seats, depending on whether they are standard / quiet / hot, we’ve put together a few tips to help you decide what might be your ‘best seat’ on this particular aircraft. Generally the flight was satisfactory, the seat was comfortable and the staff responsive and polite. Despite the lack of legroom, my seat was comfortable enough. I did appreciate that even though there is no footrest, there is no entertainment unit reducing the space under the seat and I was able to stretch my legs out comfortably. The toilets were clean and appeared to be serviced regularly. Our seats at the rear of the aircraft were quite noisy thanks to being behind the engines. This is less of a problem on a day flight. The Duty-Free cart did come around but the choices were rather limited. If possible, pre-purchase your selection and have it delivered to you on board. 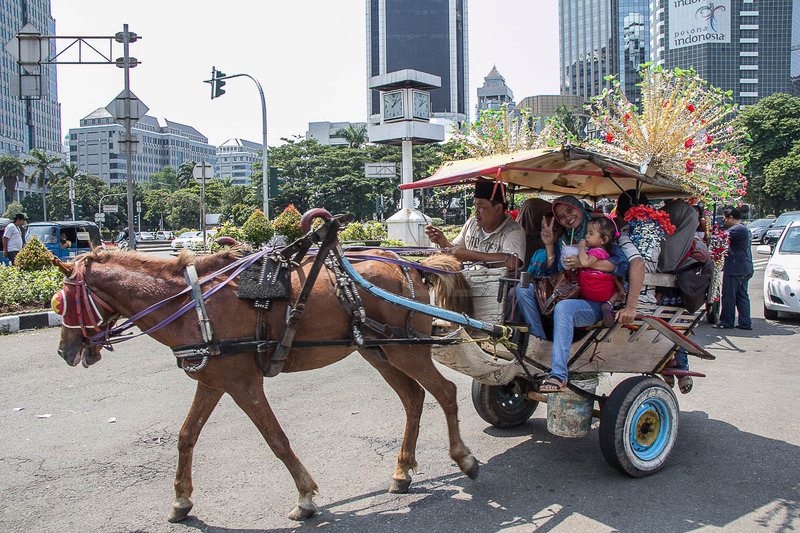 Travel by Economy Traveller was self-funded.